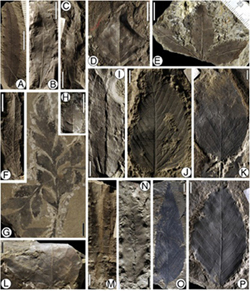 Frédéric Jacques of the Xishuangbanna Tropical Botanical Garden in Mengla, China, and colleagues excavated fossil plants from an Antarctic island. As certain plants only grow in particular climates, their fossils provide evidence that such a climate prevailed in the past. Jacques's fossils came from plants that experience seasonal rainfall. DURING the ice-free Eocene period 56 to 34 million years ago, Earth was 10 °C warmer than today. "Tropical" animals like crocodiles thrived in the polar regions, and Antarctica - now a dry, frozen wasteland - was warm and covered with lush vegetation. The discovery of certain plant fossils, however, suggests that Antarctica had a monsoon climate, something that only happens nowadays in the tropics. It could mean that in a warmer world monsoons will occur across wider areas of the planet. He estimates that during the early and middle Eocene, 60 per cent of Antarctica's annual rainfall fell in summer - about 6.4 millimetres per day (Gondwana Research, doi.org/h9n). This suggests there was a monsoon on the continent. Eocene Antarctica looks much like the monsoon climates of south Asia today, where there is heavy rainfall in summer but the winters are dry. Finding a monsoon so close to the poles is unexpected, says Gill Martin of the UK Met Office in Exeter. "It tends to be thought of as a tropical thing." Monsoon rains are driven by seasonal changes in wind direction. Moist sea air blows onto the land during summer, but in winter the winds travel in reverse. For this to happen, the land must warm up much more than the ocean during summer. Today, this only happens in the tropics, but Jacques says that monsoons may proliferate in hotter climates. "It can create new monsoon circulations." Climatologists aren't sure how climate change will affect monsoons. Their best guess is that monsoon winds will diminish, but because warmer air holds more moisture, the monsoon rains will get heavier and cause more floods (Nature Climate Change, doi.org/h9p). "In that sense the monsoon is stronger, but the circulation is weaker," Martin says. Could the monsoons also spread? It's unlikely we'll reach Eocene temperatures, but Jacques says monsoons could spring up on other continents. Martin is unconvinced. She says major weather systems like the jet streams operate close to the poles, and could interfere with any new monsoons.